Android Authority has a posted a shockingly bad piece of click bait by an author who appears to know absolutely nothing about the Japanese mobile marketplace. Either that or this is an April fools joke nine days too late. NTT docomo and KDDI versions of the Galaxy S6 lack Samsung branding. Samsung is a South Korean Company. Commenters diligently pointed out that, since the very beginning, Japanese mobile phones have typically lacked any branding whatsoever. It was also brought to the author's attention that NTT docomo model numbers distinguish between makers (e.g., F = Fujitsu, SO = Sony, SC = Samsung, SH = Sharp). To this, I'll add that maker-branding on phones subsidized by and available from Japanese carriers is a relatively recent phenomena. Because these facts – facts which the author deftly brushed aside with a brilliant non sequitur about domestic versus international models – are plainly obvious to anyone who has lived in Japan long enough to remember the golden age of galapagos feature phones, the commenters perhaps assumed the author was simply unaware. It is particularly stunning how a set of observations can be interpreted in a way that leads to such flawed conclusions. 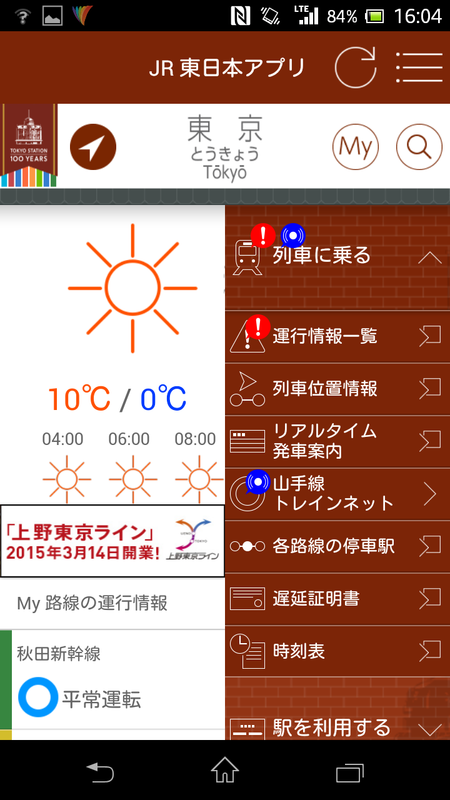 At about the same time Japan Airlines released a revamped mobile app that was actually useful, so did JR East. Many train companies have their own apps, but I rarely install them because they are only good for navigation within that particular rail network. Yeah, they probably have station information, route maps, and the like, but do you really need an entire app for that? As you can see in the above screenshot, I was riding in car 4, which was slightly more crowded than the surrounding few carriages. Car 4 had the temperature set milder (弱) but the interior temperature was not significantly different from the other carriages at a pleasant 19˚C. One of the things that completely annoys me to no end is the scarcity of carriage information posters in JR stations. You know, the ones that show which cars are close to which exits at each station along the line. If you're lucky, you might walk the entire length of a platform designed to accommodate a 15-car train and find between zero to one of these important posters, whereas the subway operators place them every few 10s of meters. 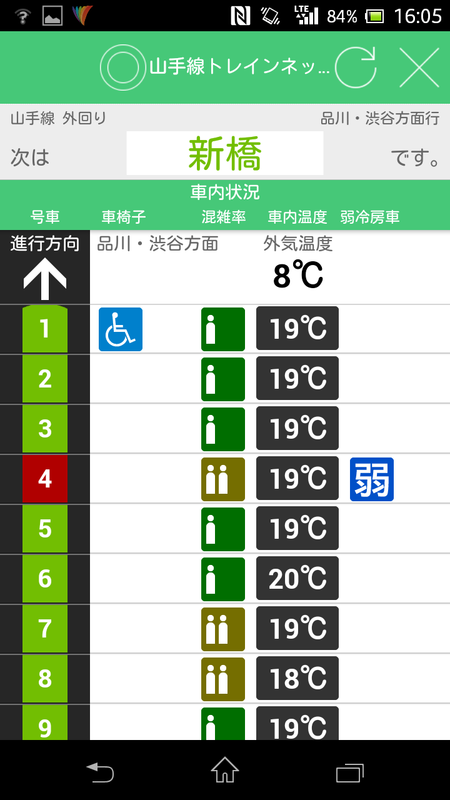 This app can also show you the platform information for upcoming stations, so that if you're on a tight transfer, you can head towards the carriage closest to where you need to be. Unfortunately, all these cool features are limited to the Yamanote Line. I imagine that will change because it's possible to do this with any train that has on-board wifi. It's of course only available in Japanese, but as the 2020 Olympics approach, expect an English (at least) localization. The app's home screen is expectedly a bit cluttered, and it's difficult to know exactly where to go to access these features. 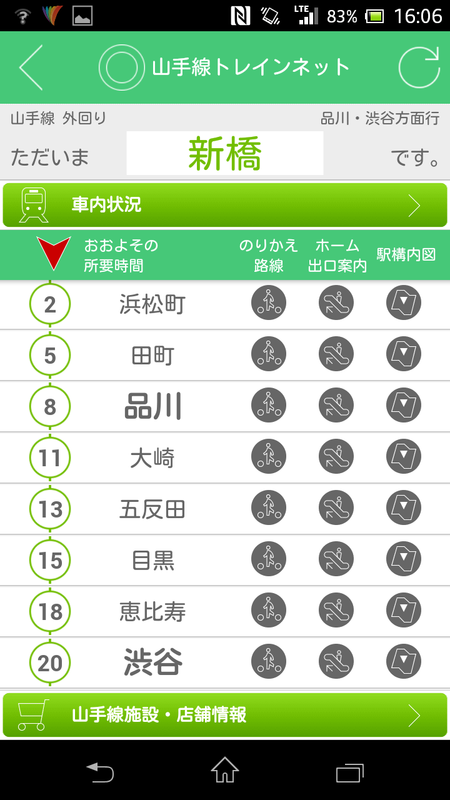 To get to the features I described, access the 山手線トレインネット.